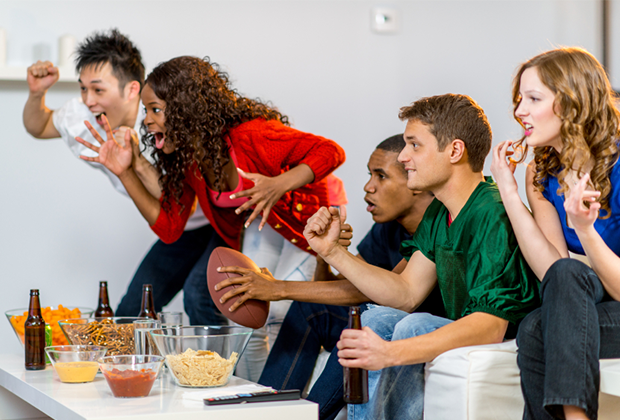 The big game is coming up and you’ve orchestrated your party plans with the confidence of a seasoned veteran. You’ve got your chicken wings, your famous eight layer dip, and the perfect chip-to-veggie ratio. The drinks are on ice and the guest list has been oh so carefully curated. Things are almost perfect – but even the most experienced hosts often forget the secret ingredient to a perfect football party: Wi-Fi. Really, really fast Wi-Fi. What’s Wi-Fi going to add to your shindig? Glad you asked. People at your party are going to be doing a lot more than just watching the big game. They will be checking first half stats, talking smack on a forum, taking Instagram pics of the aforementioned wings, tweeting about that heartbreaking interception, and much more – all on their smartphones or tablets. That’s right – the much-discussed “second-screen” is going to be a major player at your party. A recent Nielsen survey shows that nearly half of all smartphone and tablet owners use their devices while watching TV. Taking in the big game is no longer a passive experience – people want to share, discover, and communicate — all at the same time. Make sure you have a Wi-Fi network that will deliver the speed and coverage your friends and family need to get the perfect second-screen experience. Might we suggest the AC1900 Wi-Fi Router (DIR-880L)? It’s got next-generation Wi-Fi speed to handle second (or third, fourth and fifth) screens. You have your IPA or wine of choice, you snuck onto the comfiest couch when Uncle Mort vacated, and your team just entered the red zone. It all seems pretty sweet until your little ones appear with the dreaded “I’m bored” on their lips. Not to fear! Wi-Fi can help you here, too. Let’s be honest: Big Game Sunday is primarily an adult wonderland of delicious food and adult beverages. But that doesn’t mean your kids have to suffer. With fast Wi-Fi and a media player or game console hooked up to another TV, you can stream thousands of movies and shows that will keep the munchkins entertained and occupied. Whether its Netflix, Hulu or Amazon Prime, streaming entertainment will give your kids what they want and allow you to enjoy an amazing party without any guilt. Or at least less guilt. Yeah, we know Bruno Mars is playing the half time show this year, and we know a lot of people at your party will probably want to watch him. For a certain kind of animal lover, though, half time means one thing: baby animals pretending to be football players. Let the Bruno fans have the TV – we’ll take our animals on a tablet, thank you very much. You have two options here, and you’ll have to feel out the crowd to see what they want. Animal Planet offers Puppy Bowl, wherein dozens of puppies roughhouse on a miniature football field. It’s filled with fur, slobber, play fighting, and tiny footballs. It features a human referee. It’s completely ridiculous. And yet it will melt the heart of the grinchiest grinch at your party. A strange and adorable tradition unlike any other, the Puppy Bowl is in its seventh season and gets better every year. For my cat people out there (I’ve got a nose for my own), there is a newer player on the scene: Hallmark Channel’s Kitten Bowl. As a 31 year old man, I turn into a crazy cat lady awful quick while watching this. Dialing shelter numbers and adopting cats sight unseen, etc. But enough about my crushing loneliness – let’s talk Kitten Bowl! It’s the yang to Puppy Bowl’s yin. Imagine tiny kittens batting around a little plush football and you’re half way there. Ok, you’re all the way there. But it’s enough, trust me. Whatever baby animal bowl you choose, you’re going to need powerful Wi-Fi to stream it to all those tablets. By the end of halftime, no one will even be paying attention to Lady Gaga (the singer); they’ll be paying attention to :ady Gaga (the miniature schnauzer pup). We trust you on the food, the drinks, and the people. Trust us on the Wi-Fi. It will turn a good party into a great party, and a great party into a reason to call in sick on Monday. Make your football soiree memorable with a modern, connected approach. But don’t blame us when they want to come back next year (even Uncle Mort).